It is not exactly unsurprising that the recent Telegraph report on the potential grounding of commercial aircraft didn't get much traction in the rest of the media. It was played low-key in the business section, while the Commons drama was rampant. As a result I can't recall it being copied by a single newspaper. The same can't be said of The Times which yesterday did its own version of the story, reporting the background and the response to the letter from aerospace representatives to Michel Barnier alerting him to the gathering crisis and calling on the UK and the EU-27 "to allow technical planning conversations between EASA and the CAA". This I have already covered in depth in two posts on this blog, here and here, both of which were ignored by the legacy media. We are, of course, invisible – except when they need to steal our stuff. Unremarkably, though, when The Times managed to produce its own half-baked version - with considerably less detail than we were able to offer - it was enough to bring out rampant coprophagia in the rest of the media. Most national newspapers have rushed to copy The Times, none of them adding anything significant to the story by way of their own research or clarification. Based as it was on an initiative by ADS and the General Aviation Manufacturers Association (GAMA), it was almost inevitable that The Times story should perpetuate the error of the aerospace manufacturers, in assuming that there was any possibility of meaningful talks between the EU regulator, EASA, and the UK body, the Civil Aviation Authority (CAA). Thus, we had from The Times the claim that "Brussels bars aviation chiefs from preparing for no-deal", based on an unconfirmed assertion that the European Commission had intervened after the aerospace industry had contacted Barnier, specifically to prevent EASA and the CAA from holding talks. However, had the paper take more note of what I had written in my second piece, they would perhaps have understood that – in the absence of a Withdrawal Agreement and the transition period - it is not possible for EASA to enter into talks with the CAA to secure the optimum outcome, a Bilateral Aviation Safety Agreement (BASA). This, I observed, is a full-blown treaty and can only be negotiated by the EU and the UK government. And, to do that, they need to use the formal procedure set out in Article 218 of the consolidated treaties. Such negotiations are way above the pay scale of the agencies and, as with the broader post-Brexit relationship, the negotiation process can only be undertaken once the UK has left the EU and formally acquired the status of a "third country". Failing the settlement of a BASA, there is provision within the Basic Regulation (Regulation (EC) No 216/2008) for inter-agency agreements between EASA and the "aeronautical authorities of third countries" (Article 27). But, once again, the qualifying requirement is for the UK to assume the status of a third country. However, we are also aware that, without such agreements and in the absence of a transition period, UK parts fitted to EU-registered aircraft will no longer be validly certified, the aerospace industries and airline operations of the EU Member States will be as badly affected as UK enterprises. This is something that The Times and partners in coprophagia have comprehensively missed, even though many online commenters seem very well aware of this. Essentially, with this and other issues, the EU and its Member States cannot afford for the UK to break out of the EU without a deal any more than can the UK. And on that basis, there is good cause to assume that the EU will take active steps to avoid a "no deal" scenario taking effect at the end of March 2019. How far it will go is anyone's guess, but it does change the entire political architecture, putting the UK in a better position than might be supposed. The danger is that the EU will engineers a "sudden death" for the UK at the end of the transition period, once it has bought enough time for its Member States and got what it needs. Returning to The Times story, we see the story copied out more or less intact by The Mail, The Sun, the Guardian, Metro and the Express. Yet not one of the derivative writers questions the basic, flawed premises from The Times, that the European Commission is wilfully blocking talks between EASA and the CAA. They have their narrative – the big, bad Commission being "nasty" to the UK. In fact, it is more that case that there is no value in entertaining discussions between the bodies as nothing can be achieved. There is no "plan B" that the industry regulators can draw up to keep the airline fleets flying. And it is unlikely that the EU is any happier about the situation than we are. This, one might add, is where it is so necessary to understand how the EU operates and what makes it "tick". Here, we have a conjunction between the political and the technical and, when you are looking at the EU, you cannot neatly partition off the two and treat them separately - the two are intertwined and strongly influence each other. Thus, unlike UK Westminster politics, where the "lobby" can entertain itself endlessly with court gossip, covering the EU requires a wider knowledge of issues and an appreciation of how the parts fit together. Another point here is that, while The Times managed to take note of the relevant Notice to Stakeholders when it was stuck in front of them, the paper seems unable to take on board the scope of the problems. From their story, you would be forgiven for believing that this issues just affects aircraft – even if the Mail and the Metro manage to confuse this problem with the Open Skies Agreement. The Mail also manages to mix up EASA and Eurocontrol. 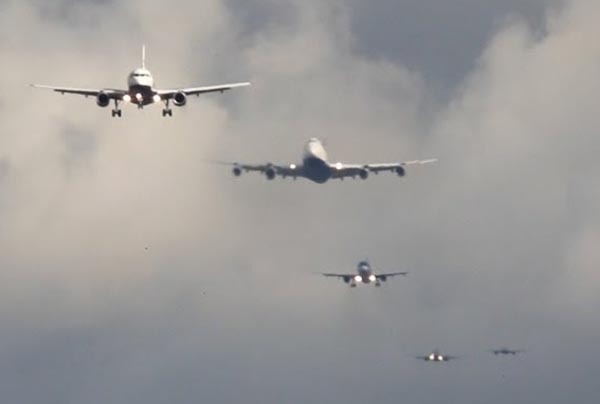 Aircraft apart, though, it is the case that a "no deal" scenario would mean that the operational certificates for Heathrow and all other UK airports would no longer be recognised. That would not only apply to EU Member States but also its other partners, such as the United States, which accept EU-mandated certification. One can see the EU taking heroic measures to keep its Member State airline fleets flying but being less rigorous about keeping UK airports in operation. If there are adverse effects to come from a "no deal" scenario, therefore, it is more likely that we will see Heathrow, Gatwick and all the others restricted to flights by UK-registered aircraft. The odd thing here is that, while the prospect of air fleets being grounded qualifies as news, Heathrow effectively being shut down apparently isn't. And nor is the media concerned with the fate of the air traffic management system, the fact that many pilots will no longer have valid licenses, that it will be impossible to get an aviation medical in the UK and even simulator instructors will be prevented from practicing. As it stands, the story of a potential grounding of the aviation fleet is already yesterday's news, and being dismissed by many as "project fear" – and not without good cause. It is hard to see that the EU will stand idly by while Member States aerospace industries and airlines are shut down. But that is not to say that the UK will be able completely to escape any fallout from the massive reorientation of aviation regulation that must follow Brexit. We will be lucky if we can escape the worst consequences, but a degree of damage is inevitable – the only real question is how much. Here, we are on our own. The moving finger of the media has written, and moves on. The dogs bark, the tents are packed and caravan disappears into the night, the story never to be revisited until some new development – usually some trivial oddity – captures the imagination of an editor somewhere in the interstices of London hackery. Thus, none of us go into the future fully equipped to understand the implications of a "no deal" scenario, while charlatans such as Minford can peddle their wares without fear of challenge from the zombie media. When journalists themselves don't understand the implications of what they are writing, and are unable to report fully on what passes, the debate will remain ill-served.